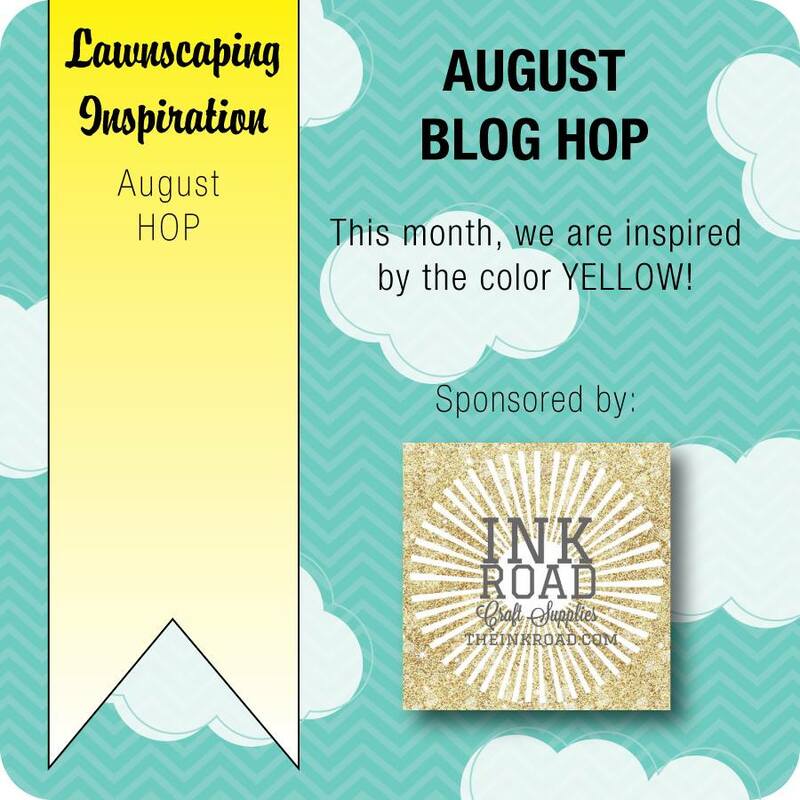 Paper Pawz: Lawnscaping August Blog Hop - Yellow! 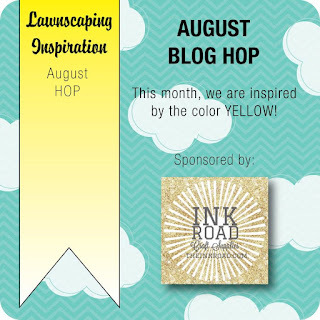 Good morning all Kim from the Lawnscaping FIT team and welcome to the August Blog Hop Sponsored by The Ink Road you could win a $25.00 gift certificate to this store! 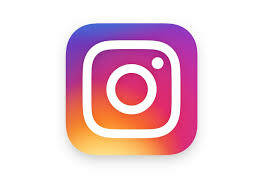 All you need to do is leave a comment with a trackable e-mail on each stop on this hop! 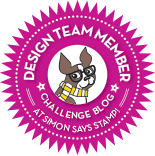 You will have arrived here from the talented Suzanne's blog! When I saw that the inspiration for August was yellow, the first thing I thought of was the fantastic Lawn Fawn birds! Love me some Lawn Fawn birds! I used one of my Lawn Fawn Let's Polka 4bar cards and I die cut one of the stitched circles for my background and a scallop circle (all Lawn Fawn) from vellum. I stamped some sun rays on the background piece then stamped a variety of Lawn Fawn birds and Copic coloured them, the balloon, branch and banner! Added the stitched clouds and some sequins! I also did some creative sentiment stamping using two different Lawn Fawn sentiments. Your next stop on the blog is the talented Lexa! If you run into any broken links along the way simply go back to the Lawnscaping blog for the entire list! Oh how cute is this? Love the little birds and all the yellow. So happy! Now that is a very Happy birthday card! This is my favorite! My cat Muggsy loves it also! So cute! I love the yellow card and the birds! Especially the subtle sunburst in the background! I love the vellum clouds! How cute is this card?!! Love it!! This is just too cute! Love the little pop of purple. Fun card Kim. Love the puffy white clouds and your happy little birdies. Super cute! I love the vellum, and those birds are just so fun! Super super cute!!!!! So cheerful, and made me smile!!! Awesome job!!!! Wow this card is so cute and cheerful I just love it. Love that sentiment and the birds are just so cute! Cute card. The little splash of purple looks great with the yellow. Aaawwwweeee.... this is so cute! Those birds are adorable! Love the play on word card, so cute. Vellum use is great. I like it! 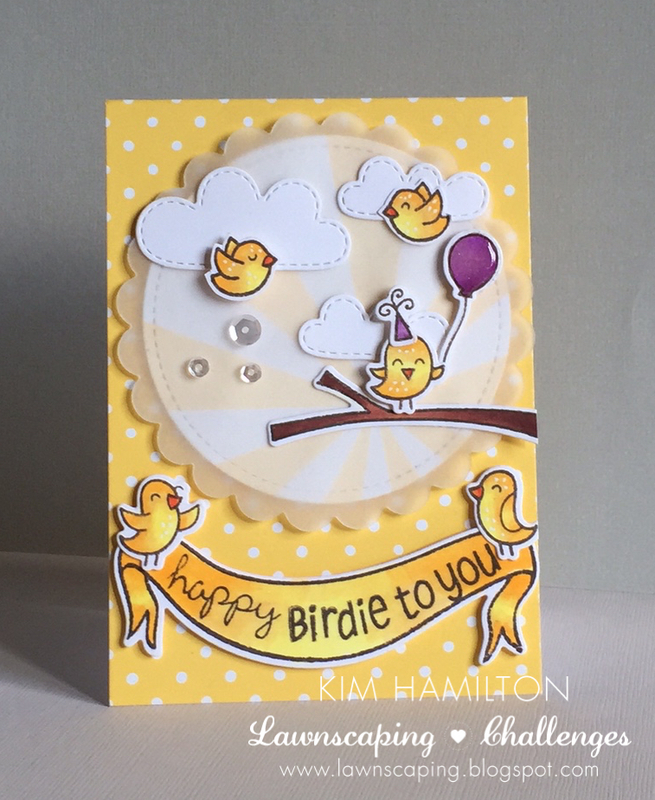 Yay for yellow - I love your little scene with birdies and the clouds!!! So much fun. Love your card. Thanks for the inspiration. There is so much to LOVE about your card! It is adorable and fun and I just love all the pretty details! What a bright, happy, and fabulous card! Love how you mixed and matched stamp sets and fonts to create this adorable card! Oh my word, this is absolutely adorable!!! 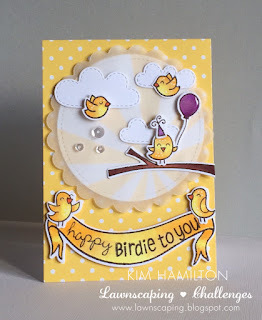 So much fun detail and cheerfulness with your cute birthday birds. This is so adorable and cute! I love the little birds! What a sweet greeting! I am enjoying all of the yellow inspiration! Such a cheerful colour! Thanks for the fun blog hop! This is adorable!! Such a fun birdie party!! Cute birds! Love the yellow paper too! Very cute card. I Love the purple accent. Super cute & fun!! Love the adorable birds.